Pietro Beconcini lays claim to being the only producer in Tuscany that grows Tempranillo. It is a claim steeped in centuries old lore. Of course, Tempranillo is the famous, primary red grape from Spain, responsible for the wordly reds from Ribera del Duoro and Rioja. So how did it end up in this small corner of Tuscany? The ancient Via Francigena passes directly through what is now Pietro Beconcini’s wine estate, alongside the very vineyard that provides the Tempranillo for Beconcini’s wine. Religious pilgrims, on their way to Rome arrived from all over Europe, since the two main routes of the Via Francigena originated in Canterbury England and Santiago di Compostela in Spain. At the time, priests, in addition to their religious charges, were also responsible for overseeing agricultural undertakings. New vineyards were started in those days by planting grape seeds, primarily because over long journeys it was easier to carry a small container of seeds rather than an awkward, heavy bundle of vine cuttings. This fact strengthens the results of Beconcini’s DNA research, which indicates that a high percentage of tested genetic material is identical to Spanish Tempranillo, but with small obvious evolutionary differences expected in a vine that was started from a seed and not from a mature cutting. 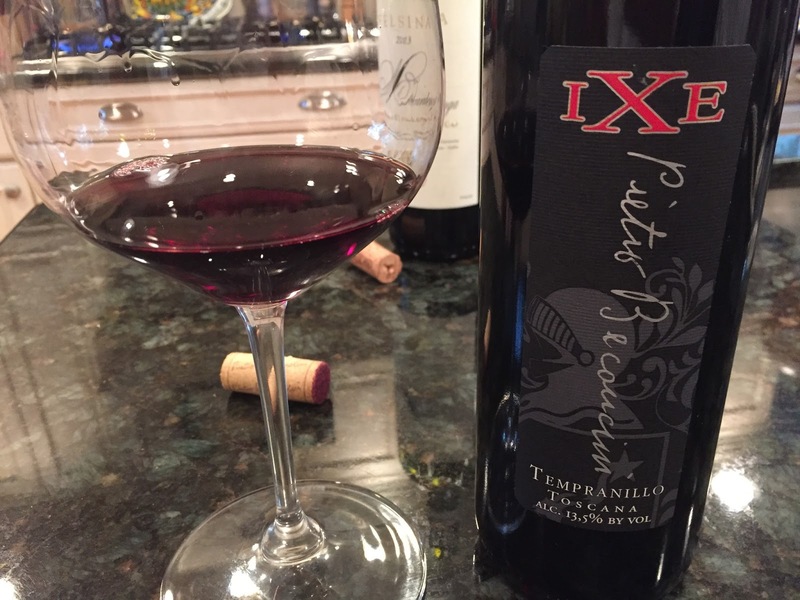 Beconcini produces two Tempranillo from the Vigna alle Nicchie – one flagship red of the same name and one entry level rosso called IXE – the “X” paying homage to the strange “Vine X” that was growing on the estate prior to Beconcini’s genetic mapping. In the glass the wine is a medium violet color with pretty reflections. It is difficult not to peg this as a Sangiovese. To me, Tempranillo is very similar to Sangiovese to begin with, and this one, with Tuscan accent, would be a great ringer in a blind tasting. Pretty aromas of tobacco leaf, cherry, mocha and turned earth rise from the glass and the flavors in the mouth echo that of the nose. Good persistence and balance in this medium weight wine which is predominantly Tempranillo but has a small proportion of Sangiovese blended in. Aged for 12-15 months in barrels that were previously used for its older brother, the wine is bottle aged until it is 2 years old upon release. Very nice value here. 88 points, about $15 retail. Disclosure: This wine was a producer provided sample. Ciao Eva! Thanks for commenting and reading Tuscan Vines. I still have a few more of your wines that I have to taste and review, including the Chianti Riserva and the Vigna alle Nicchie. Looking forward to it!